(2017/Blue Barrel) 12 Tracks - Digipack - Fantastic authentic Memphis Rhythm'n'Blues featuring John Nemeth doing the vocal part! Recorded live at Bar DKDC, Memphis, Tennessee! 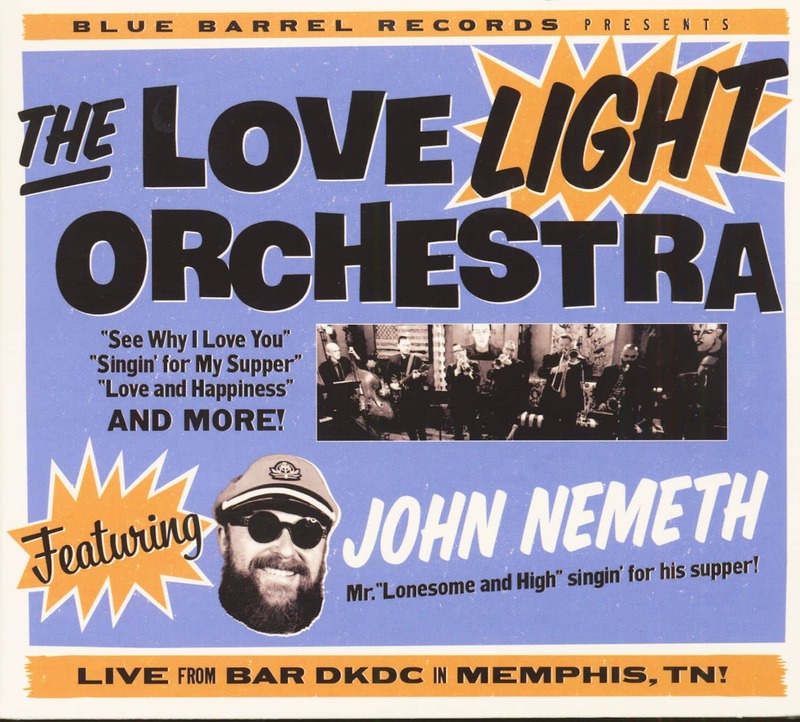 "The Love Light Orchestra with John Nemeth"
The phrase 'The Memphis sound" often evokes Sun rockabilly or the mid-'60s "deep soul" era of Stax, but a style equally important in the city's rich musical history was the big band blues found on the singles of Bobby "Blue" Bland, B.B. King and Herman "Junior" Parker. It's a sound proudly celebrated today by The Love Light Orchestra, a group of seasoned Memphis musicians whose name derives from Bland's 1961 hit "Turn On Your Love Light." The 10-piece band—initially envisioned by guitarist Joe Restivo, vocalist John Nemeth and arranger/trumpeter Marc Franklin—also reveals their affection for Bland here through covers of "I've Been Wrong So Long" and "Poverty," and they tip their hat to King and Parker through, respectively, "Bad Breaks" a nd "Sometimes." 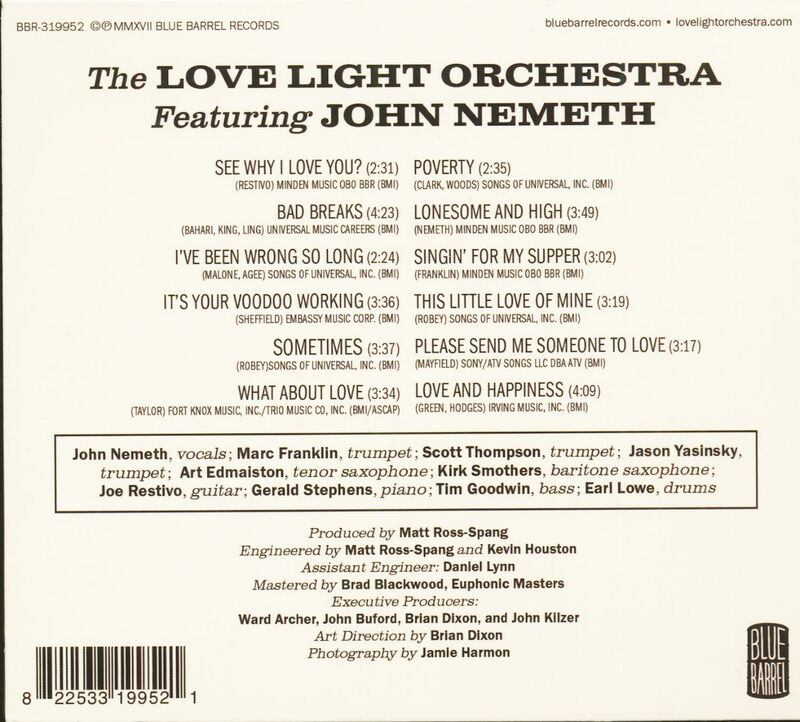 The Love Light Orchestra's overall sound, says Franklin, was inspired by Joe Scott, the longtime arranger for Bland, whose work Franklin discovered after he was hired to play with Bland in the early '90s (Saxophonist Art Edmaiston and drummer Earl Lowe also did stints with Bland). "The first time I heard his work, it sounded like Ellington, but more downhome, with extended harmonics that you don't necessarily hear on blues or soul records. It's a jazz thing, throwing extra notes into the chords—at Stax they didn't do 6th chords." The Memphis sound of the `50s put in the sophistication with the horns, but it never lost that gritty aspect of the blues," says Nemeth. "And the spirituality in the vocals was tremendous—the melodies have such great movements, and the lyrical rhythms are perfect." Guitarist Restivo has plenty of solos here, but notes, "We wanted to make a horn record, so the featured instrument is saxophone. That was the axe of choice on Beale Street at the time.' Grammy winning producer/engineer Matt Ross-Spang cut the record at the tiny DKDC bar in Midtown Memphis, and recalls, "It was more or less done after we cut it." "This music is really supposed to be heard live, to be in the room to feel the horns, and it turned out magically—lightning in a bottle twelve times in just a couple hours." 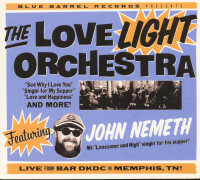 Customer evaluation for "The Love Light Orchestra Featuring John Nemeth (CD)"